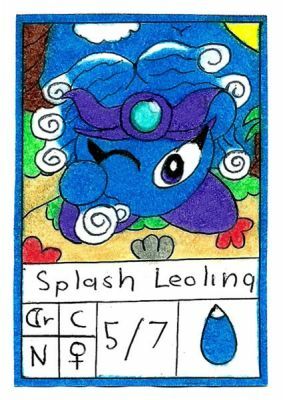 This is Splash Leolina, she is another amazing creation of KCCh (Kirby Cosmic Chaos) Team. I'm very grateful with alll KCCh team for giving me the permission to draw their character and now Splash Leolina belongs to KTCG and KAA but only if KCCh team allows she to join in these two new adventures. Also, i add a new look for her. If they allow it, this is a possible description for her. Kirby Cosmic Chaos is the best fangame of all, thanks again to all KCCh Team for give the permission and i hope that us enjoy this card. Gosh, Leolina is really cute~! I love how you did the tiara, and how you made her hair loook like the ocean. The pearl on her tiara is really nice, as are her eyes. For some reason, I really like her shoes~ I like the swirly palm tree in the background too. Real nice job, Kiroscarby~! Very good interpretation of Splash Leolina! Gotta say, it must've taken a long attention span to get every last detail right, 'cuz you've drawn her like a pro. Overall impressive! I agree! The perspective is great, too. The tiara design is rather nice. Thanks to all for us awesome comments. @Aero: This is great honor that you like Splash Leolina but she isn't my idea, she is original idea of KCCh. I decided add a new look for her, for that she looks different to the other Splash Leolina. I enjoy that you like the background, actually i trying to make better the backgrounds because they are one of the most important thing in the cards. Thanks for enjoy my work. @Chibi-Pohatu: Time ago that i don't see you, thanks for enjoy this card, this card was be one of the hardest cards to draw of all because i needed pay attention in each detail of her and i needed to create a new look for her too. This a honor that you like her. Thanks for all and congrats for your awesome comics too, i can't wait to see your next comic. @kirby123: Thanks for your comment, i like that you enjoy my work and that you enjoy the new look of Splash Leolina. Thanks for all.